Today classical music and jazz travel in two distinctly separate streams, rarely intersecting. During the early decades of the twentieth century, however, symphonic jazz - whose most famous composition was ""Rhapsody in Blue"", by George Gershwin - involved an expansive family of music that emulated, paralleled, and intersected the jazz tradition. Though now largely forgotten, symphonic jazz was both a popular music-arranging tradition and a repertory of hybrid concert works, both areas of which reveled in the mildly irreverent interbreeding of white and black and high and low music. While the roots of symphonic jazz can be traced to certain black ragtime orchestras of the teens, the idiom came to maturation in the music of 1920s white dance bands. 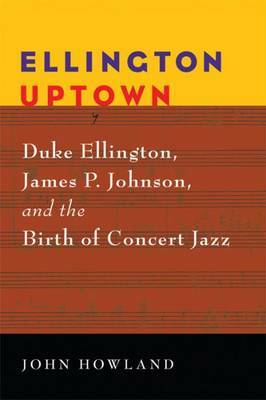 Through a close examination of the music of Duke Ellington and James P. Johnson, ""Ellington Uptown"" uncovers compositions that have usually fallen in the cracks between concert music and jazz.It also places the concert works of these two iconic figures in context through an investigation of both related compositions by black and white peers as well as symphonic jazz-style arrangements from a diverse number of early sound films, Broadway musicals, Harlem nightclub floor shows, and select interwar radio programs. Both Ellington and Johnson were part of a close-knit community of several generations of Harlem musicians. Older figures like Will Marion Cook, Will Vodery, W. C. Handy, and James Reese Europe were the generation of black musicians that initially broke New York entertainment's racial barriers in the first two decades of the century. By the 1920s, Cook, Vodery, and Handy had become mentors to Harlem's younger musicians. This generational connection is a key for understanding Johnson and Ellington's ambitions to use the success of Harlem's white-oriented entertainment trade as a spring-board for establishing a black concert music tradition based on Harlem jazz.